The D-53PLT2 is designed to economically and quickly strap most kinds of pallets and skids using standard or heavier polypropylene strapping. The D-53PLT2 can cut the time it takes to strap pallets up to by 90% when compared to hand tools. Its simple operation entails pushing the track into the pallet void, pressing a button to feed the strap, and inserting the tip of the strap in the machine - and within 2 seconds your strap operation is completed. The D-53PLT2's unique design allows the operator to strap pallets as low as 350mm or 14". Arch track swivels to the vertical position for easy transport. The height of the track (off the ground) is also adjustable to three positions depending on the type of the pallet or size of its void. For edge protection insertion, the manual mode can be selected to control strap completion. 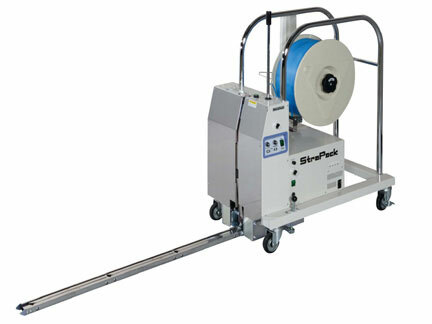 This Strapack D-53PLT2 can pay for itself in labor savings in as little as 3 months. Call one of our friendly machine specialists today for a free labor savings calculation. Strap Widths Accepted - 3/8", 1/2" and 5/8"
Max Strap Tension - 156 lbs. Strapping Material Core Size - 8" x 8" or 9" x 8"